I’ve spoken before how different my two children are. My oldest child, Olive, seemed to come out of the womb and only want to be with me. I believe this trait in her personality (which I am now very grateful for) caused her to struggle with going down for naps. She wanted to be with me so badly that the simple act of separating myself from her made her quite angry and frustrated. My younger child, Milo, was an “angel baby”. If I didn’t do this work and know so many children perhaps I wouldn’t have taken such note of his temperament, but knowing what I do helps me see that he is an absolute anomaly amongst babies. Milo slept well for naps very early on – he took to my schedule and slept for nearly every nap for as long as I wanted him to. He slept well at night, took well to early night-weaning, and on more than one occasion I counted a 12-day span without one.single.cry. As Milo has grown older (as of this blog post date he is 26 months old) he has had some struggles with sleep. He has a parasomnia called Rhythmic Sleep Disorder in which he can frequently rock for 2-3 hours at the start or middle of the night – he is often awake almost the entire time. For the most part, however, he has always gone to sleep easily and without complaint, and has been happy to stay in his crib for whatever duration of time I deemed his sleep period should last. But, Milo is a human, and I knew that eventually he’d start to realize that I stay awake while he goes to sleep, and that he’d rather stay with me than have me leave him alone in his crib. For months I’ve been waiting for this to rear it’s head, and a few weeks ago, it finally did! It started with a small protest when I put him in his crib. Where normally he’d lay down happily, this time he cried out for me. I reassured him gently, and he lay down. However in the last week or so he has grown to a full-on cry when I leave the room. If I weren’t a sleep consultant, I would have thought something was wrong with him. 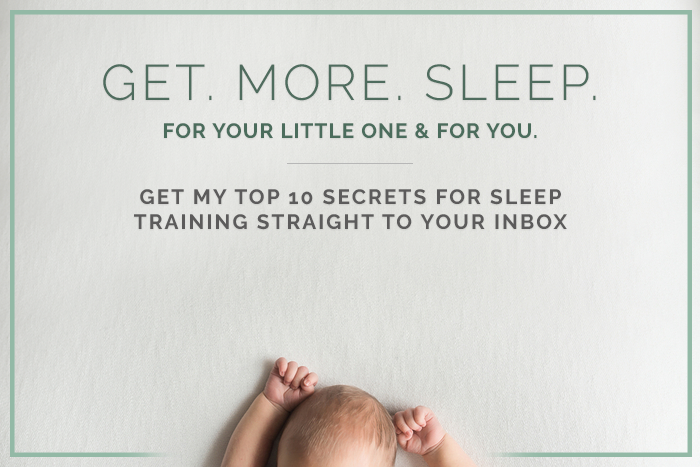 I would have gone to him, comforted him, then started telling all my friends that, “He used to be such a good sleeper until this separation anxiety started, and now he won’t go to sleep without me!” But, I am a sleep consultant! I know first hand how my seemingly minor actions can have enormous impacts on my kids for weeks and months into the future. Today Milo cried hard when I put him down for a nap, he called my name and spent several minutes crying. A small part of me wondered whether he would stop and go to sleep, and then I reminded myself that if he decides to start down the path of no naps (like many toddlers do), that would be his choice, but that I would not further incentivize him to stay awake. He was out cold in 7 minutes. So many clients come to me after having made a few decisions they thought were largely inconsequential. Please know that so many of the choices we make as parents, even the ones that appear minor, can make a huge difference down the line. Don’t be a credit card parent – don’t give in and do things that make “right now” easier if you know down the line you’ll have to remedy a behavior. Take it from me, it’s not pretty and it’s not easy. Work hard to instill good practices and guidelines now for how you will deal with potential issues as they come up in the future. We all come to forks in the road with our kids – should I let him work through this night waking or should I go to him right away? If my daughter expressly disobeys me but I’m comfortable on the couch, should I get up and immediately address the behavior, or just let this go? Your small acts, your choice when you come to the fork in the road, can make a bigger difference than you think. Love this Natalie! Great post.